The Antique Mall of Lubbock, the premier antique store in Lubbock, was founded in 1985 specializing in American Antiques and Collectibles. Over 24000 sq ft, 50 booths and 100 plus showcases. The Antique Mall offers one of the finest selections in the Southwest. Who would of dreamed that one of the best Antique Malls in the Country would be located in Lubbock in the heart of the south plains of Texas. Stop searching, we have what you are looking for !!! Antique Mall of Lubbock is unique in its large selection of General Store, Drug Store and Pharmacy items including but not limited to Old Store Stock, Advertising Signs, Store Displays, Soda, Tobacco, Sporting, Tins, Jars, Drug Store, etc. We also have a large selection of Toys, Posters, Calendars, Oil Company items, Militaria, Dolls, Glassware, Pottery (Roseville, Rookwood, Weller, Van Briggle, etc), Western Memorabilia, Vintage Clothing, Fiesta, Depression Glass, Kitchenware, China, Graniteware and Crockery. The Antique Mall has Quality Early American Oak Furniture, Mahogany and Walnut Victorian Furniture and related accent pieces, Ranch Oak, and Primitives. Pocket knives, Pocket watches, Huge selection of Costume Jewelry and Estate Jewelry, and Sterling. Also see our large library of books and magazines. There is far too much to list. Really one of the finest Selections in the Country. 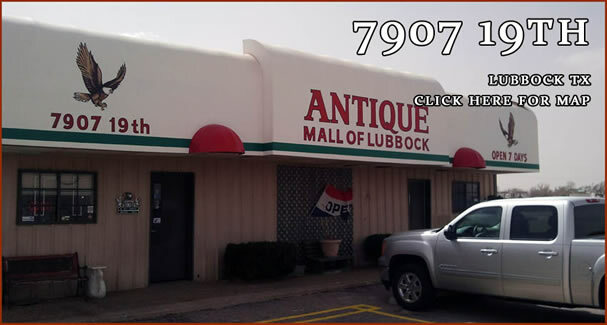 Many customers have said over the years that the Antique Mall of Lubbock is the Best Antique Mall they have ever visited. Come See us Soon! You wont be disappointed.